Make room for this formalwear staple. 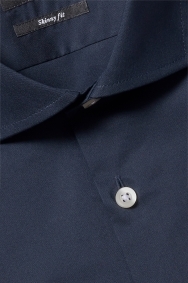 Expertly tailored from a cotton-rich fabric, this navy shirt from Moss London deserves a place in the dressier side of your wardrobe. 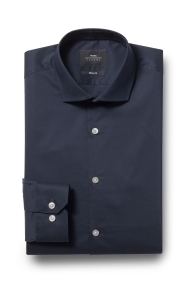 Whether you’re heading to the office or town, this versatile piece is a smart choice. The extra slim fit will provide you with a chiselled profile, while in-built stretch properties guarantee total comfort. This shirt certainly ticks the boardroom box, but pair it open-necked with jeans and you’ll have a strong casual look that’s ideal for evenings out. Great fit. Longer size is perfect.